The Roland DR-880 Dr. Rhythm drum machine offers an innovative design featuring a Hi-Z instrument input with complementary multi-effects and proprietary COSM amp modeling. The unit offers a large library of drum sounds and kits, preset rhythm patterns and chord progressions. The DR-880 Dr. Rhythm Groove Modify templates allow the user to change the feel and character of the preset patterns, and the EZ Compose feature, with dedicated access buttons, allows for quick composition and arrangement. The DR-880 Dr. Rhythm is a versatile, reasonably priced solution for enhanced personal music production requirements. Box Dimensions (LxWxH) 15.7 x 12.4 x 4.4"
DR-880 Dr. Rhythm - Drum Machine is rated 4.6 out of 5 by 16. Rated 5 out of 5 by Anonymous from Console gaming for guitar! The amount of guitar playing/practice I do has probably quadrupled ever since I got this thing. Seriously! It has also helped me out in learning music theory (as well as helped me move to the next level in my playing - improvisation). It is also an excellent songwriting tool. Once you become accustomed to the interface, programming beats and bass lines is relatively easy. It offers a good selection of amps and effects. Not as huge as some software but the sound is very good. Mine has never crashed or frozen up either. They are rather versatile also. I often use it at band rehearsals rather than lug ye olde Peavey bandit around all week. Rated 4 out of 5 by Torment Leaves Scars from Nice Product! I just got a DR-880 about a week ago, and have been working to familiarize myself with it. I use the DR-880 to play along to on my guitar/bass. It has some very nice features, including the touch feature...the harder you hit a key, the harder the note is. This makes for some realistic sounding drums. I also really like the huge variety of preprogrammed drum beats. It wasn't hard to find one to work with the types of music I play. While there are a lot of features, I have not found this to be an easy product to figure out. There are a lot of things to learn, and can be overwhelming at first, especially if you don't have prior experience with using this type of equipment. Rated 5 out of 5 by Mark F. from DR-880 Encourages Playing !! :) I'm a hobbiest musician and practicing and playing are more enjoyable when you have some accompaniment. The DR-880 does this well providing drums and bass for many genres of music. The sounds from the DR-880 are rich and very realistic which really helps to encourage one to play more. The DR-880 has an input for guitar, either electric or acoustic, or bass and has built in modeling effects to enhance the instruments sound. So far I've only tried electric guitar through it and the resulting sound was very good and easy to balance into the mix of drums and bass. Programming patterns and songs is very easy once you you get the hang of the menus. I have owned an Alesis SR16 since they were introduced years ago and I never really liked trying to write patterns to it. The DR-880 is really a big step up from the Alesis unit in this respect. I haven't found anything I don't like about the DR-880 as of yet. Boss gear has a good reputation for design features and durability, so it makes it difficult to find any negative points. Rated 5 out of 5 by A.J. Miller from AWESOME AND THEN SOME This Machine is very user friendly, after reading the manual I spent a few hours playing around with it and before I knew it, I recorded my first sample. Everything is displayed on the menu screen, programming is not that easy but once you get the hang of it, it's easy. The programmed beats are nice and the sound is so realistic that it makes up for the extra money this machine cost. Rated 5 out of 5 by PlTATINUMSMITHS SONGWRITERS from No Second Opinion Needed Sometimes it is hard to make a decision, because there are so many opinions floating around. With Dr-880 Dr, Rhythm, We made the right choice. This Product is awesome in every way. It is great for rehearsals, gigging, and not much has been said about The Boss 880 as asset for composing music/writing songs. No regrets, love it. Rated 3 out of 5 by guitar obsessed from good if you dont like pc's If you only have an electric guitar and this piece you are good to go. Its just much more awkward and inflexible then computer programs though. On the other hand, its very stable. Rated 5 out of 5 by Anonymous from Drum Machine Review I'm using the machine for home recording. I'm a singer/songwriter/guitar player. The presets were very complimentary to the music I'm writing. The instructions were easy to follow. The ability to plug my guitar directly into the machine made it very portable and practical to take anywhere. I have recommended this machine to many of my friends who also do home recordings. memory is very limited, only able to store 28 songs ( not very complicated classic rock ) any suggestions ? 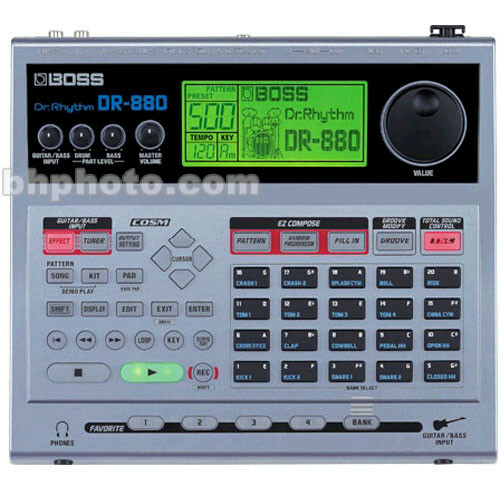 Does DR-880 has pedal switch? The DR-880 has inputs for a foot switch (model FS-5 or FS-6) and an experssion pedal (model EV-5). It does not have a specific input for a guitar pedal. The DR-880 has many selections of guitar effects (Compressor, Wah, Chorus, Phaser, Flanger., Tremolo) which saves you the need for one of these guitar pedals. If you have a favorite guitar pedal with a different effect than the ones described above you could insert it between your guitar and the DR-880. Hope this helps you. Is there a shortcut that I can do to shift directly from one pattern to another beside the dial wheel and the bank? Will the bass change chords when you change chords with your guitar? If you asking does the bass follow along with what your playing on the guitar the answer is no, bass line would have to be programmed. Your guitar is an audio signal, the drums and bass are MIDI.